When we think of Saints and Sages, we usually do not think about poets. 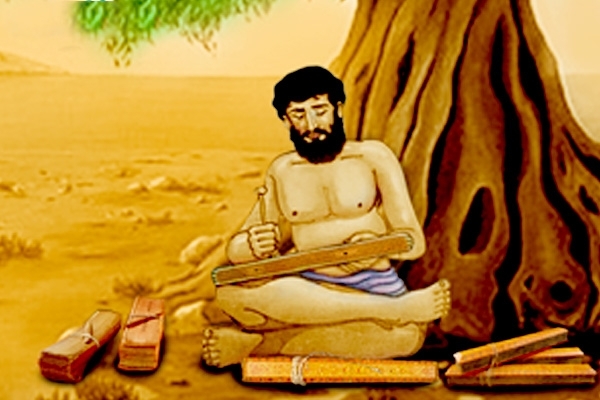 Yet history shows that some of the famous spiritual people were poets like Kavi Kalidas and many others. Perhaps one of the reasons for this is that a poet also has to meditate silently in order to get that inspiration from within. After all the source is the same, irrespective of whether the external manifestation is in the form of poetry or pravachans. Not many of us do know about this person known as Vemana or whose full name was Gona Vema Buddha Reddy born in Andhra Paradesh somewhere towards the second half of 17th century. He was a much below average person during his early childhood and even teenage. Most people around him thought that he was born a fool and they would make fun of him as a child. When Vemana was fifteen he could not even recognise all the letters correctly. Vemana was made fun of by everyone. However, his guru did not give up on him and tried to ensure that Vemana learnt something or the other each day. One day the guru went it take bath in the river he gave Vemana his clothes and told him to hold these till he finishes his bath. The Guru had instructed Vemana not to put down the clothes as the river bank was muddy. Vemana as usual forgot what the guru had told him and dropped the clothes. The clothes got dirty and the guru was as expected very angry on Vemana. He gave Vemana a chalk and told him to write Rama on the rocks. Vemana started to write. He was very upset that he had again disappointed his teacher. The chalk wore off and then Vemana continued with his fingers. Slowly the fingers also started to bleed and Vemana was in pain. The guru came back in the evening and he was shocked to see what had happened. The Guru started crying to see the state of his student’s fingers. After this incident a great transformation happened which was no less than a miracle. Vemana became a poet and he started to come up with brilliant poetries. He slowly became very popular and it was almost impossible to even believe that a person as talented as him could have been so dumb as a child. He wrote hundred poems and each one of them were equally popular. What could have happened to Vemana that day when his teacher punished him? Was it a miracle that he became a scholar post that day or it was something else? Vemana that day realised that he had a huge ability to focus on something. This is an ability that most of us do not have. If you can focus on something for a long time no matter how weak you are at that activity you can master it. Vemana realised that he was not intelligent but if had a task in hand he could focus at it like none others. If you have a goal in mind and you are completely focused at that goal you will achieve it. Even the forces that rule the universe will help you achieve something that you are completely focused at. We all need focus to succeed. If you look at hurdles that humans have overcome throughout ages you will realise that these could not have been possible if we did not have the ability to focus and only think about the goals. Nothing is actually impossible if you have made up your mind to achieve it. This is exactly why we also say that God will also help those who help themselves. When you are focused at something and whole day you are thinking about the same you will realise that you can solve the problems that are coming your way. Some will say that this happens because you have faith in God and some will tell you that it is basically your mind that is working and showing you the solutions. Just get a goal for yourself and start to work towards it. Focus at it and do not change it no matter how impossible and difficult it may seem. You will realise that slowly all the forces that were against you are actually helping you and you will also realise that the difficulties are vanishing. No matter what stage of life you are in and what part of the society you belong to the challenges will always remain the way they are. A successful person is one who can work a way around these challenges and succeed. If you change your goals you will never succeed. Each one of us has a different level of focus. If we work on it we can change our ability to focus too. So be persistent and work towards your goal. Love your dreams only unconditional love for your goals can help you achieve the impossible like Vemana did.